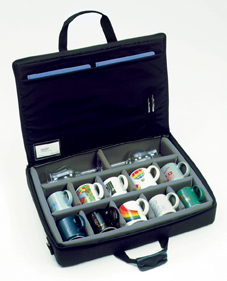 A modular divider system in a heavy, foam-lined Sample case for the salesperson on the road. Our adjustable divider system has a combination of double wall foam and high density polyethylene perimeter that allows for extra strength and rigidity. Case includes handles and an adjustable shoulder strap for easy portability. We offer 18 standard sizes each adaptable for any product line samples.